The report measures the hourly compensation costs – salaries and benefits paid out plus whatever it costs to administrate those benefits and wages. The report paints a depressing picture for private employers versus public employers, with the private employers paying out $27.73 in total compensation per hour, while state and local governments paid out a cool $39.81 an hour. 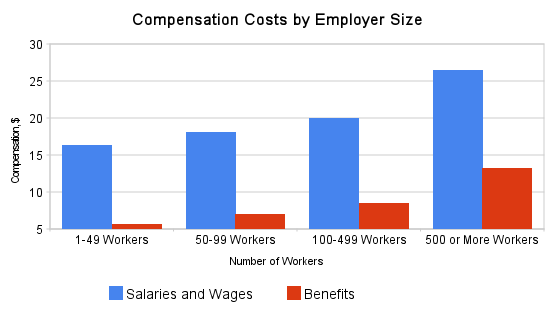 Overall, workers compensation cost $29.71 in March. Of course, I’m only giving you the topline numbers. 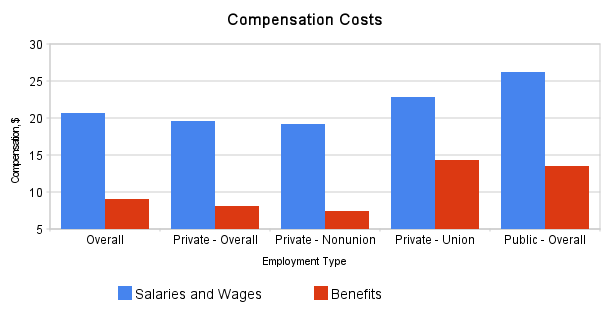 If you take a look into the report you can compare across categories, and compare types of workers and their compensation, which is a much better gauge of disparity. For example, take the ‘Sales and Office’ category, where public trumps private to the tune of $27.63 vs. $21.77 in per-hour compensation costs. Fair? Unfair? Who cares? Let me know whatever way you fall! I suspect there are going to be some changes coming soon to the public sector. The government is broke and we can’t afford all of those well-paid people on the payroll. Additionaly, the public pensions are way underfunded and there is not enough money for a bailout of this magnitude. There is a fatal flaw in this story and most stories like this. The compensation COSTS are out of control for State, Federal, and Local Governments but that does not mean that the all of the workers are overpaid. Governments pay way too much for things. This is the central problem of government. Most of these costs go to contractors, consultants, administrators, patrons and other political hacks who support the political party in power. The benefits cost a lot but they are only a little better than those in the private sector. Also the costs are reported for workers who don’t even take the benefits this is another way of hiding money used to pay friends and political donors. So the rank and file workers get accused of making large salaries–they don’t ….while the political patrons sit back and collect their free money and dole it out to their friends. Don’t get me wrong – there are plenty of bums working for State, Local, and Federal Government but there are also a lot of underpaid, working people who get blamed for problems they have no power over. Its all smoke and mirrors and the public eats it up. The politicians are crooks who corrupt the entire process and they repeatedly get off the hook because the public is baffled by their bs. Well, in this case there is an unexplained pay gap which has persisted for quite a while, and it’s around 12%: http://online.wsj.com/article/SB10001424052702303828304575180421298413374.html. Of course, it is unfair to compare numbers directly between the ‘average’ worker vs. the ‘average’ government worker, since the ‘average’ government worker has a better education than the average American. The unexplained pay gap is for real… and the benefits are as well. For sure, I agree with most of your comment. The problem exists with anyone who spends anyone else’s money however – not just government.